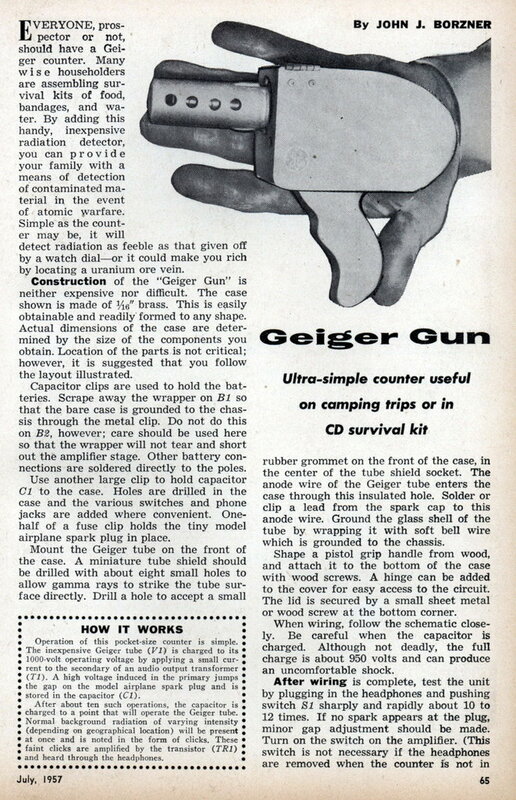 Construction of the “Geiger Gun” is neither expensive nor difficult. The case shown is made of 1/16″ brass. This is easily obtainable and readily formed to any shape. Actual dimensions of the case are determined by the size of the components you obtain. Location of the parts is not critical; however, it is suggested that you follow the layout illustrated. Capacitor clips are used to hold the batteries. Scrape away the wrapper on Bl so that the bare case is grounded to the chassis through the metal clip. Do not do this on B2, however; care should be used here so that the wrapper will not tear and short out the amplifier stage. Other battery connections are soldered directly to the poles. Use another large clip to hold capacitor CI to the case. Holes are drilled in the case and the various switches and phone jacks are added where convenient. One-half of a fuse clip holds the tiny model airplane spark plug in place. Mount the Geiger tube on the front of the case. A miniature tube shield should be drilled with about eight small holes to allow gamma rays to strike the tube surface directly. Drill a hole to accept a small rubber grommet on the front of the case, in the center of the tube shield socket. The anode wire of the Geiger tube enters the case through this insulated hole. Solder or clip a lead from the spark cap to this anode wire. Ground the glass shell of the tube by wrapping it with soft bell wire which is grounded to the chassis. Shape a pistol grip handle from wood, and attach it to the bottom of the case with wood screws. A hinge can be added to the cover for easy access to the circuit. The lid is secured by a small sheet metal or wood screw at the bottom corner. When wiring, follow the schematic closely. Be careful when the capacitor is charged. Although not deadly, the full charge is about 950 volts and can produce an uncomfortable shock. After wiring is complete, test the unit by plugging in the headphones and pushing switch S1 sharply and rapidly about 10 to 12 times. If no spark appears at the plug, minor gap adjustment should be made. Turn on the switch on the amplifier. (This switch is not necessary if the headphones are removed when the counter is not in use.) When a radium watch dial is brought near the holes on the tube shield, a rash of clicks should be heard. When it is taken away, the normal background count will be resumed. As a strong radiation force is brought close to the “Geiger Gun,” clicks become more rapid. Any increase above normal cosmic ray background radiation should be investigated. Keep battery B1 fresh for best results. When you go on that hunting or fishing trip, take this handy counter along. Remember, uranium is where you find it. Operation of this pocket-size counter is simple. The inexpensive Geiger tube (V1) is charged to its 1000-volt operating voltage by applying a small current to the secondary of an audio output transformer (T1). A high voltage induced in the primary jumps the gap on the model airplane spark plug and is stored in the capacitor (C1). After about ten such operations, the capacitor is charged to a point that will operate the Geiger tube. Normal background radiation of varying intensity (depending on geographical location) will be present at once and is noted in the form of clicks. 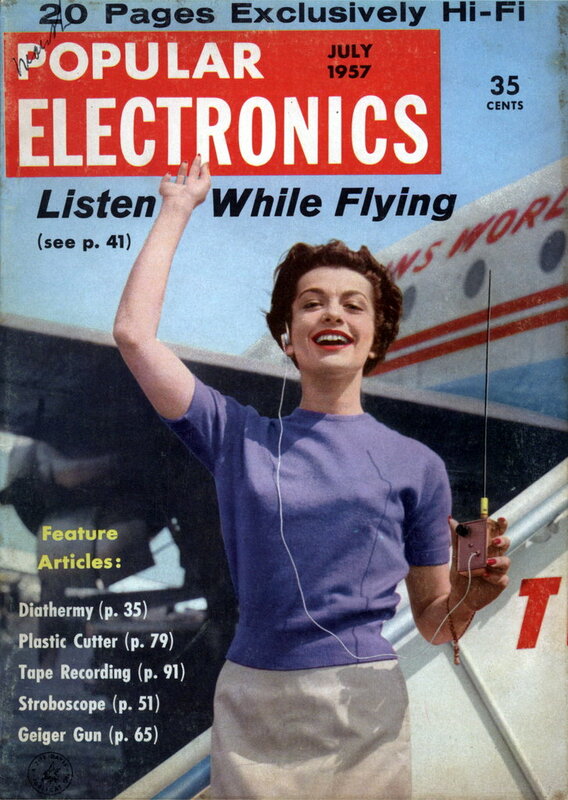 These faint clicks are amplified by the transistor (TR1) and heard through the headphones. The Geiger tube was, is and shall be available in every grocery store. He’s probably referring to the irradiation of fruits and vegetables to kill bacteria. Much humor has revolved around glowing oranges and geiger counters in the basket. The terrorists won’t get us with dirty bombs, it’ll be with dirty fruit. An apple a day will stop keeping the doctor away, etc. My father built this when I was a pup back in the atomic age cold war. Everyone took it seriously back then. He worked at GE in Syracuse and probably swiped some sheet metal from the plant which is why the GE logo is on the case. We used to take it on trips to Maine where we were finding “uranium” all over the place.